The ocean moves against the rocky shore in the near distance, its restless blue tongue a temptation. The longer I stare across the silver-green olive groves that fill the valley, the more the sea beyond them beckons. I turn my back on the view. Today I am the Pythia, and must cleanse myself. Pilgrims outside the temple await the word of Apollo, the sacred speech which should issue from my mouth, but has been absent these two days. There is comfort in ritual, even though the body that works through the motions is not as young as once it was. My knees creak, my back catches, and my breasts droop like summer's withered blossoms. Still I kneel and bend, and take the spring water into my hands. Apollo, have you forsaken me? Do I not follow the motions Gaia herself once made? There is no answer, but then I expect none. I dry my hands and pick up the nearby knife, to take cuttings from the laurel trees. I pluck nine leaves and chew them as I make my way back to the temple and my private hearth, where I burn the remaining leaves and immerse myself in the smoke. At the sound of the small chime, I rise. The smoke has made my eyes momentarily useless, but after thirty-five years, I know my way. I count the steps along the darkened stone corridors and feel the hair on my arms rise as the temperature plummets. In this sunken stone chamber, the adyton , the air is damp and smells of burnt laurel and rotting flesh. Deep within the crevasse which bisects the room, Python rots, slain by Apollo himself. The tripod is uncomfortable, but my backside is well acquainted with the ancient seat. I sit with a sigh—no, I will not walk into the ocean today—and wait. Clytie lights a small lamp and brings me a shallow basin with a laurel branch. I take both in hand and stare at my reflection, wavering and indistinct within the water. The water ripples, as though he is coming, but it is only the trembling of my hand. Local pilgrims take precedence over all others. The king and his men are seen to first, the peasants after. What the king wants is easy enough to know; he has asked the same question every year of my duty. Will the troops find victory in their coming battle? I can answer even without Apollo. Each man will come home, with his shield or on it. What the peasants want is more difficult. I had thought answering questions about crops and weather would be simple, but it is not. These people are the very blood of Delphi; I cannot betray them, and yet with every word that comes from me and not Apollo, I feel I do just that. I cannot tell a man his child will live through a fever when I do not know such a thing. Clytie relates each question to me through a laurel wood screen. For thirty-five years I have rarely heard the pilgrims' voices, for most of the time, I have been deep within Apollo's sway. But now, I hear each one, some stuttering as they ask their questions. How long did each one wait, I wonder, for these nine days when Apollo is supposed to answer? Every sign said that he would come; every sacrifice said his voice would command as never before. In a way, twisted and backward, I suppose that is truth. "Approach and ask," Clytie says to the next pilgrim. "Gentle Pythia," speaks a familiar voice. "I come to ask of my wife, Daphne, of when she will return home. Like Penelope I sit and wait, and still she does not come." This man Erastus has asked after his wife once every year, for thirty-five years, knowing full well that she sits on the other side of the laurel screen; knowing that she is me. Each of us has given up family to serve Apollo. Mothers, fathers, and some husbands. But Apollo requires chastity of us, and once chosen, how can we deny him? I left my husband as a young woman of twenty; it is my smooth face which he pictures, my hair still wholly brown. Last year, Apollo told Erastus that the scent of an oil lamp is strongest when the flame has been extinguished. I could feel the rushing air all around me; I flickered, but still I have not gone out. This year, I wait for Apollo; I will him to speak, to answer this question in truth and not the falsehood I can provide. But Apollo does not fill me. The water in the basin moves as my tears break the surface. If I remain unable to speak for Apollo, my time at the temple will be short. I could remain and tend the eternal fire, but flames are nothing once one has been filled by a god. Still Apollo does not come. Instead of speaking for Apollo, I dare to speak for myself. "Your wife will come this season," I say, which elicits a small gasp in the other room, "provided another god does not claim her." Even as Apollo grows silent, his uncle Poseidon whispers against my ear. Clytie brushes my silvered hair with the strength of ten men. She does such when she is angry. I gently push her back. Clytie rarely needs a second summons to do anything. "Pelagia heard the pilgrims today, daring to complain that the Pythia took too long to carry Apollo's word. There was talk—and you will forgive me, Pythia—that Apollo has abandoned this place. Many pilgrims left when the rains came this evening." It is nothing I have not feared myself, that Apollo has taken the sun and fled. I watched the skies this evening, when at last I could leave the adyton and no longer reach for his voice. Apollo's hand seemed nowhere near when the clouds parted to allow the setting sun to glimmer on the sea. I wonder if that blasphemous thought will be enough to rouse the god, but I feel no sense of him as Clytie takes up the comb again. "He will come tomorrow," I say, closing my eyes against Clytie's strong ministrations. "There are six more days." I rise on the fourth morning feeling ill. Still, I seek the spring water and wash myself. I cut the laurel, and chew the bitter leaves on my way to the temple. With smoke-blind eyes I make my way to the inner shrine. Clytie hands me the basin; my aged, lamp-lit face reflects dimly back at me. I try to feel Apollo, but feel only the hard seat beneath me. Before Clytie can move away, I grasp her hand and return the basin. Half blind, I flee the chamber, knowing Clytie will summon another Pythia for today's questioning. As I make my way to my private hearth, I see Rhea's robed figure walking to the spring. My heart twists at the thought that Apollo will fill her today even as he rejects me. I kneel at my hearth and strip my robe away. Naked, I burn more laurel leaves, sweeping the smoke into my face, over my hair and breasts. My time cannot have passed so soon. Did the elder Pythia feel the same when I came to Apollo as a maiden? I shudder to think that it was so, that they too kneeled on unforgiving stone and begged Apollo to return. "Hear me, Apollo, golden one. I await." Head thrown back, hands raised to the ceiling, I wait, and wait, and feel only the hard stone beneath my knees. Later, I hear the screams. I gain my feet and stagger to the doorway. Rhea is carried to her room by three priests who try to hold her but cannot. Rhea throws herself against the walls, claws at her skin. She cannot stop screaming. When she finally does, later that evening, she is dead. Madness has seized the most faithful of us; Apollo is well and truly gone. Mortals should not kneel so long without moving. This is a truth that no one warned me of, but that I shall pass to the maidens when they come. The next morning, the walk to the adyton is more difficult than ever, for reasons beyond my stiff knees. I approach the chamber knowing no one awaits me. Apollo would not let one of my sisters die, not if he were still here. I take the basin and smile at Clytie before she moves off to the outer room. With the basin in my lap, I pluck the laurel leaves from the branch and drop them into the water. They maneuver like dark ships, my face weaving between them. Perhaps there is no Apollo, I allow myself to think as I await the first question. Perhaps there has never been. This dank room, this uncomfortable chair, it is no wonder that I would conjure a god to relieve the emptiness. Perhaps we are all going mad like Rhea. "Gentle Pythia," speaks a familiar voice late in the day. "I come to ask of my wife, Daphne, of when she will return home. Like Penelope I sit and wait, and still she does not come." I straighten in the chair, wondering at Erastus's return. The same question, which I have already answered. I strain to see him through the screen, but there are only shadows. I look instead to the basin and its leaves, bumping gently into one another. But he does not. My watery face and colorless eyes look back at me. I focus on them and touch fingertips to water, but it is tears that wet my fingers. Salt water on my tongue, the ocean, and I step out of the chamber. I move into the hollow where once Apollo awaited me. The darkness of the adyton falls away and my breath catches. I choke on sunlit sea water; I am in the ocean. I reach for elusive Apollo, but he slips ahead, shadowed. I expect Poseidon to grab my fingers each time they cut through the water, but there is no sign of him. Unaccompanied, the waves frolic and guide me home. I step through a doorway to find Erastus cleaning fish. It is a smelly job, but one he enjoys. Fish scales have made his muscled arms and broad chest silver and I laugh at the sight and stench of him. He looks up with a broad smile, the same smile he gave me when I left home, to follow Apollo's call. He understood. He waited. Was it all for nothing? Erastus clasps my hand within his own. The fish scales make his touch slippery. He smoothes his hands over every wrinkled piece of me, until I am as silver as he. Glowing under a sickle moon, we walk into the ocean together. The voice is not that of Erastus, but Apollo. He touches me like sunlight and I stretch my winter limbs into his light. He fills me to overflowing and retreats, leaving me to watch his dwindling glow. Don't go, I want to cry, but remain silent, understanding at last what he means. He is not leaving me; I am leaving him, for when I look down, my feet trace a familiar path backward. My toes are dusty when I reach a doorway. My doorway. Erastus hums an old fisher's song beyond the crooked frame. I come back to the adyton with a harsh breath. The basin falls to the floor and cracks, spilling water and leaves. The sweet scent of rotting flesh reaches my nose and I wonder if it is my own. "Await the sickle moon," I say in a voice that I do not recognize. It is not that of Apollo, but neither does it sound like my own. Clytie translates for Erastus, who touches his hand to the screen before he leaves. He leaves the temple shouting; I picture him dancing and offering another goat to Apollo. Clytie tells the other priest to wait and she comes to my side. Like the basin, I too have fallen. Long ago, someone carved the words "know thyself" into the temple walls. These words are worn smooth by the trespass of countless fingers. Those who make the pilgrimage to Delphi seek to know themselves, but often leave without doing so. I am a stubborn old woman, that much I do know of myself. I came to Delphi to honor Apollo, for having been called, I could not refuse. Now, I leave Delphi having found both Apollo and myself. Apollo did not abandon me; he had only spoken words I must learn to hear. Clytie cried until she soaked through my robe. The wet fabric now keeps me cool as I walk the path which leads from the temple. Coming along that path is a group of maidens, pink-cheeked with bright eyes. I catch the glance of one, not so unlike my own those years ago. "Don't kneel overlong," I tell her and she laughs, a sound that soars against the blue heaven above us. At the end of my day-long journey, I come to a cottage by the sea. I do not have to open a door, for the fisherman who lives there, my Erastus, sits outside, in a chair that has seen many better days. His shoulders are slumped, his chest not as broad as I remember. His hair, once golden, is now a mop of silver, and I stop in my tracks. He lifts his eyes and smiles, a broad smile that is full of holes rather than teeth. I give him a similar smile, relieved that time has had her way with him. There is much beauty to be found in summer's faded blossoms. Erastus stands on stiff legs and extends a hand to me. He is not slick with fish scales; he is sturdy and firm, and wraps me in an embrace that crosses three decades. Apollo took me from these hands, and so too placed me back. Apollo who guided me, Erastus who welcomed me—as maiden or crone, as Daphne, beloved of both. I will not walk into the ocean today. Nor tomorrow, I believe. 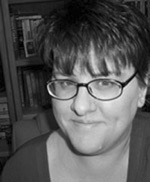 E. Catherine Tobler is a Sturgeon Award finalist and the senior editor at Shimmer Magazine . Among others, her fiction has appeared in Clarkesworld, Lady Churchill's Rosebud Wristlet , and Beneath Ceaseless Skies . Her first novel, Rings of Anubis , is now available.